Handmade porcelain plate, in 3 sizes and 5 colours. Hand thrown in England, dishwasher safe. These look great as part of a mix and match set. Handmade porcelain plates, in 3 sizes and 5 colours. Hand thrown in England, dishwasher safe. These look great as part of a mix and match set. Large white hand thrown porcelain pottery plate. Matt white. Handmade porcelain plate, small, grey. Available in 3 sizes and 5 colours. Hand thrown in England, dishwasher safe. These look great as part of a mix and match set. Handmade porcelain plate in blue. 3 sizes and 5 soft colours available. Hand thrown in England, dishwasher safe. Perfect to combine with different colours in the series. Handmade porcelain plate, in 3 sizes and 5 colours. Hand thrown in England, dishwasher safe. These look great as part of a mix and match set. Handmade nesting porcelain pouring bowls, with a choice of three or four bowls. These dimpled bowls come in four colours: pale blue, turquoise, pink and grey. This porcelain dinnerware is handmade by Linda Bloomfield in her west London studio. She throws her products on the wheel in English porcelain, using jewel coloured glazes and a tactile satin glaze. Linda is a former scientist, and so always makes her own glazes. Every occasion at the dinner table has a suitable plate size. Serve up your salad or starter on the small plate, then move on to the medium plate later in the day. Smaller party pieces can be laid up on the large plate. Theses porcelain plates were a feature in the book Nigella Express, as a platter for mirin glazed salmon and breakfast bruschetta. Bloggers and stylists are particularly fond of these macaron style glaze colours, that really give that special look to your food. 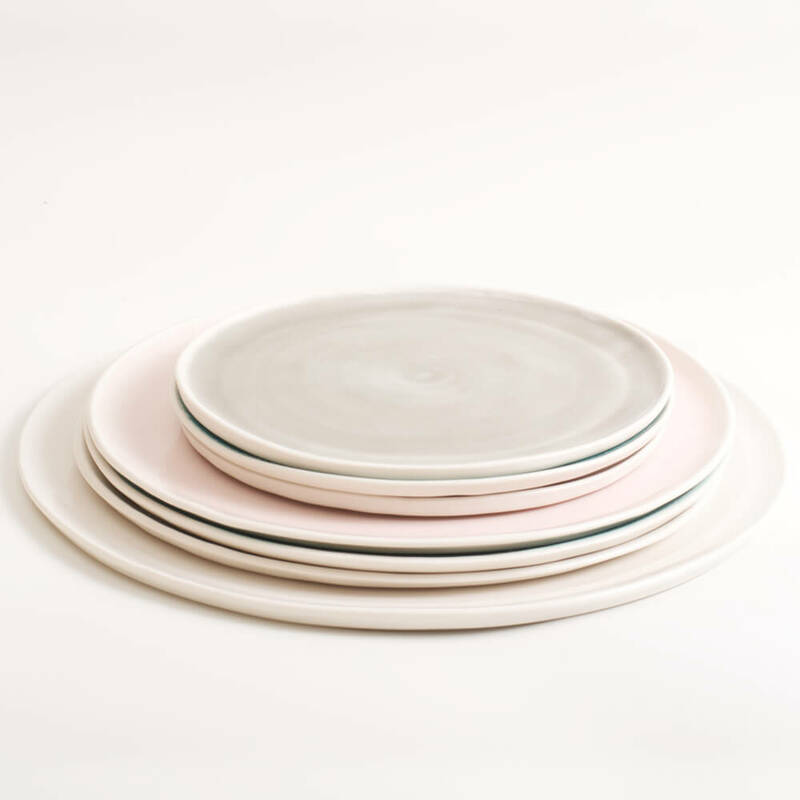 If you like these pastel plates, don’t miss Linda’s other products in the same uplifting tones, seen here. Handmade porcelain products may vary slightly from the ones shown. Note if you order items from different brands on chalkandmoss.com, they will arrive in different parcels. Small orders are sent by Royal Mail. Larger orders are sent by courier. For non UK orders, please contact shop@chalkandmoss.com for shipping cost. Most of Linda Bloomfield’s products are made to order. Plates and dinner sets take 4-6 weeks, other products take 3-4 weeks to make for you. If the product is in stock, it will be sent within 2-7 days. Email shop@chalkandmoss.com and I’ll gladly let you know if the item is in stock. Subject to the standard Chalk & Moss delivery & returns policy. Your order will be sent directly by Linda Bloomfield (who receives your name and address), as instructed by Chalk & Moss. Standard Chalk & Moss terms apply. Please note that if you order products from different designers or brands on chalkandmoss.com, these will arrive in different parcels. Shipping your order within the UK is charged at a flat rate of £5.95. If you spend more than £100, shipping is free! Please note that shipping for furniture must be calculated according to each order. So to avoid incurring an additional charge after you’ve made a purchase, I suggest contacting me first for an accurate quote on shop@chalkandmoss.com. The delivery method varies, depending on the product and quantity you buy. If you’d like something delivered outside the UK, do drop a line here and we’ll arrange this for you. A flat rate shipping cost will show on checkout. However, large or delicate orders will incur an extra shipping cost after you place your order. You’ll have the right to cancel your order at that point, if you’re not happy with the additional cost. Please drop us a line before you place your order on shop@chalkandmoss.com. We’ll give you an accurate shipping cost (which could be less or more than the flat rate) and take you through the order if you’d like to go ahead, thus avoiding an additional charge post order. Please note; you may be charged for local import duties and customs charges on the arrival of the goods in your country, outside the UK. This is out of our control and you are responsible for paying any such charges. Linda Bloomfield has made a name for herself with hand thrown porcelain tableware, which features organic shapes and visible dimples from the making process. Her signature look has a matt exterior glaze with a soft pastel colour on the inside. Instead of using commercial stains, she experiments with translucent colours from oxides and makes beautiful glazes from her own recipes. She was a materials scientist in a former life! As a maker, she hand throws her porcelain tableware on the potter’s wheel in her London studio, then fires the glazes in her electric kiln. She has two ranges; a handmade and a manufactured, which makes her work accessible with two price ranges. Her manufactured range is made in collaboration with a small stoneware pottery in the South of England. Linda’s work has been sold to the Michelin starred restaurant The Clove Club and Jamie Oliver’s Barbecoa Restaurant, and she has designed ranges for David Mellor, Harrods and the Royal Albert Hall cafe bar. The coloured homeware range is also popular among bloggers and stylists. 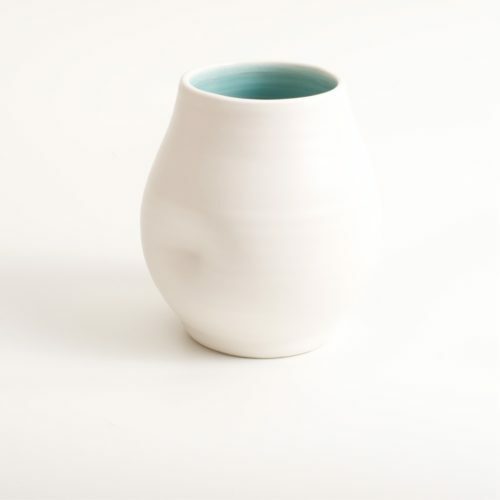 Handmade dimpled porcelain vase, hand thrown by Linda Bloomfield in London. Available with turquoise or pale blue inside. A great gift, paired with the Linda Bloomfield dimpled jug and cup. Handmade soap, a triple milled invigorating blend of natural seaweed and shea butter. The 100% vegetable based shea butter leaves skin feeling moisturised, where the seaweed leaves it refreshed. 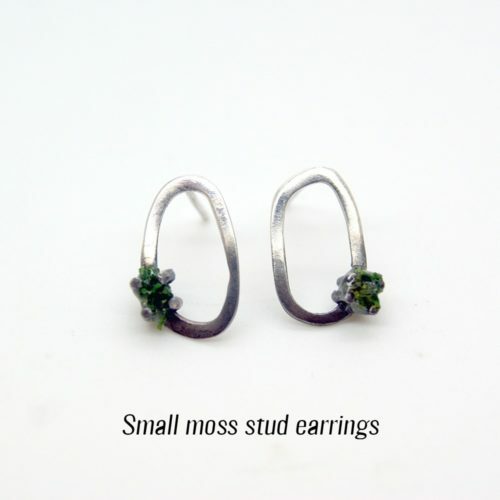 Silver earrings featuring preserved moss, to remind us of the organic nature of materials. Made from 925 silver, with a gradient (half) oxidised finish. See full description for sizes. A perfect gift for the outdoor enthusiast!